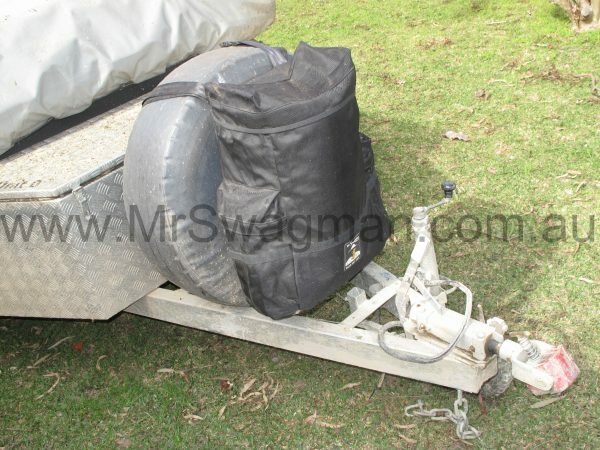 Australian delivery price for wheel bag: $20.00 Australia Wide. 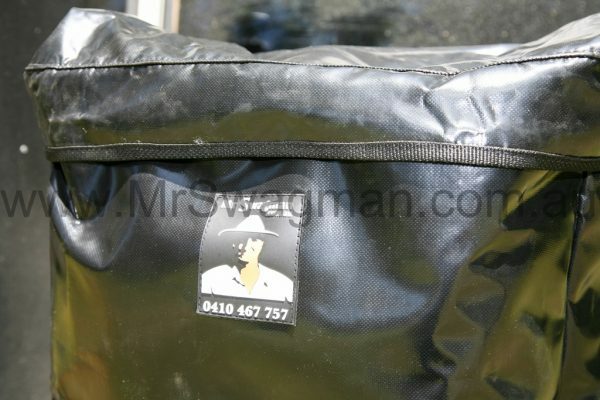 Bag is 60cm high X 50cm wide X 20cm deep. 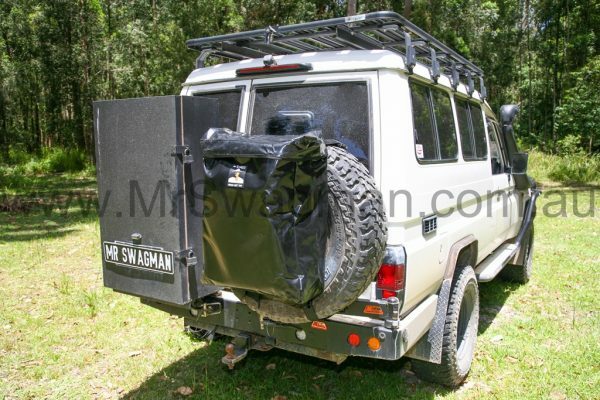 Mr Swagman’s spare wheel bag provides an incredibly handy space for storing extra gear. You can carry the kids toys, beach gear, camping equipment, fishing gear, recovery gear, tools, rubbish or anything else that will fit. This spare wheel bag fits onto the upright spare wheel of almost any vehicle, caravan, horse float, camper trailer or box trailer and is ideal for carrying any extra gear. 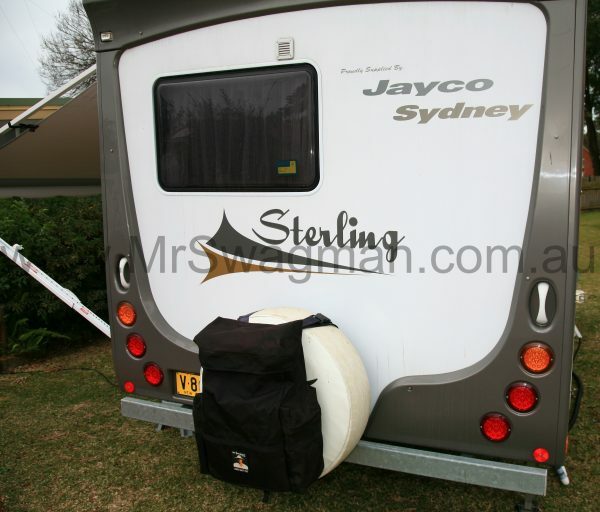 For caravaners, it’s an ideal place to carry all those water hoses, wheel chocks, rags and other dirty gear to keep the caravan boot clean. 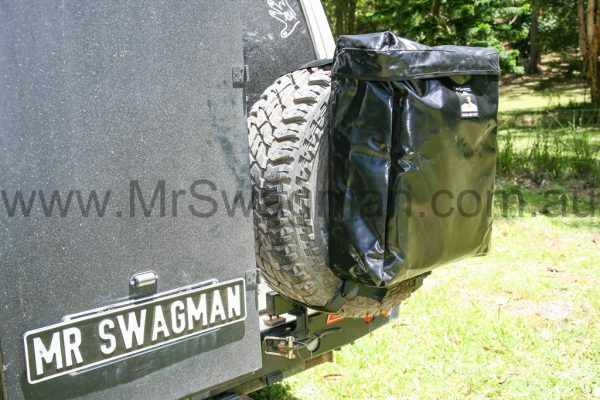 Regardless of where your spare wheel is fitted (front, rear or side), the Mr Swagman spare wheel bag will easily fit. 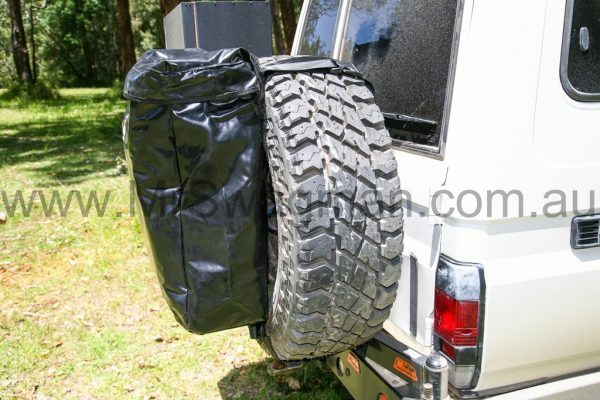 The clever and simple design of the spare wheel bag incorporates an anti-sag strap to prevent the whole bag from sliding, dropping or sagging down the face of your spare wheel. Once set, the easy-fit harness and anti-sag system will ensure the Mr Swagman spare wheel bag stays in place, regardless of the weight you are carrying (within specified tolerances) or the roughness of terrain. 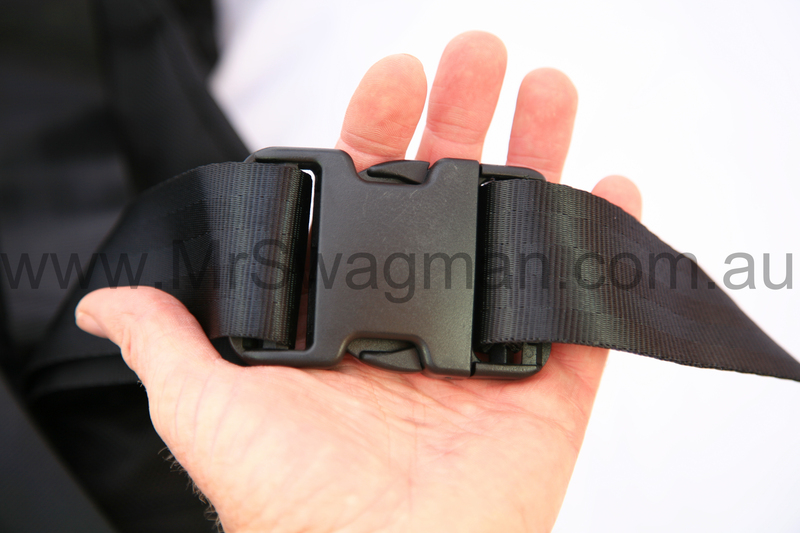 Both the easy-fit harness system and the anti-sag strap are manufactured from 50mm wide webbing – similar to a seatbelt, so is extremely strong. 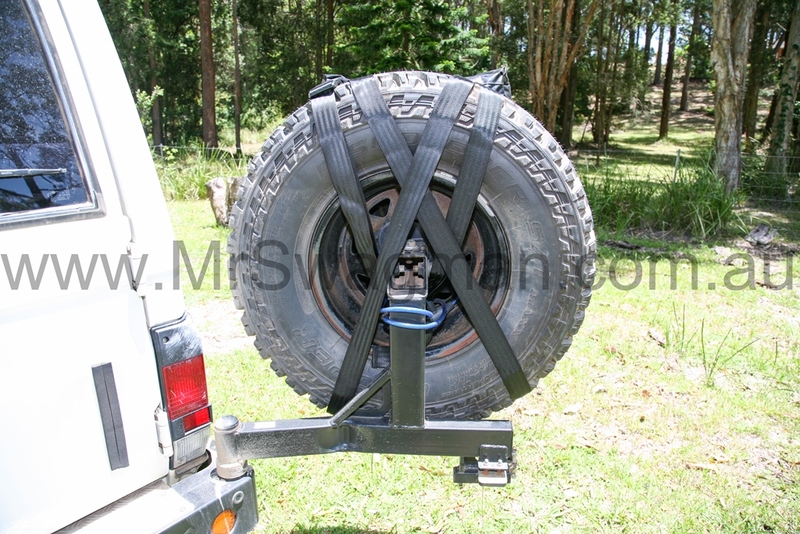 The harness is easily and fully adjustable to suit almost any sized tyre and most spare wheel mounting systems. 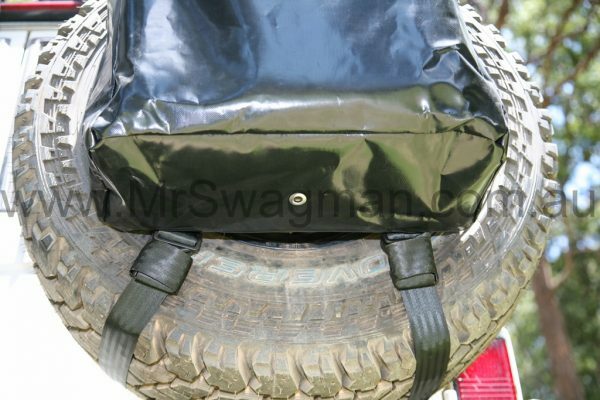 Large toothed, chunky style zippers with double runners are utilised, making for a strong and long lasting zipper that can be padlocked for safety. The complete zipper system has an over-flap to ensure waterproofness. 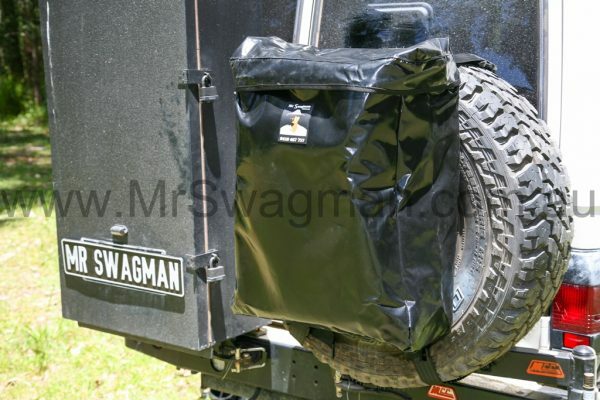 With the zippered opening and the design of the over-flap, you can achieve an extremely good seal from rain and dust. Once zipped closed the Mr Swagman spare wheel bags will not flap around while driving. 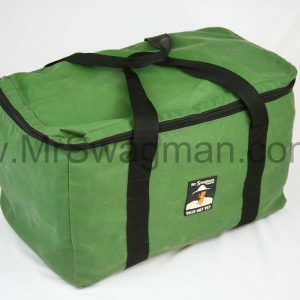 The bag is manufactured from high quality, flexible 650gsm ripstop PVC to ensure maximum waterproofness, strength and durability. The PVC will not turn brittle in cold or heat and has been proved over many years of use being the same material as on the base of all Mr Swagman swags. 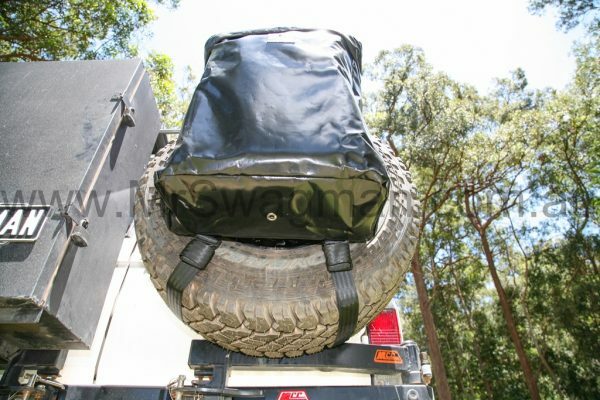 An eyelet in the base of the bag is ideal for use as a bin, allowing water from food and drinks to drain out. This eyelet is easily plugged to keep dust and water ingress to almost zero to help keep contents dry and clean. 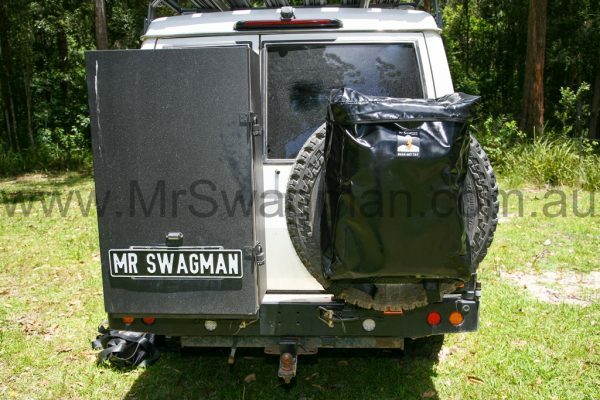 Should your Mr Swagman spare wheel bag become dirty (inside or out) it can be simply cleaned with water. Mr Swagman spare wheel bags will not go stiff, split or crack from extreme cold or heat and will not delaminate from the sun. 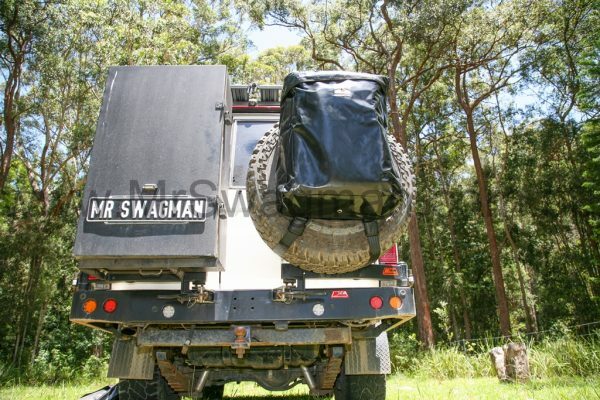 Given the large carrying capacity, a Mr Swagman spare wheel bag should be a must for all long distance tourers, weekend campers, as well as caravaners, camper trailers and horse float owners. Once you’ve quickly and easily clipped a Mr Swagman spare wheel bag on, you’ll wonder why you didn’t do it sooner! 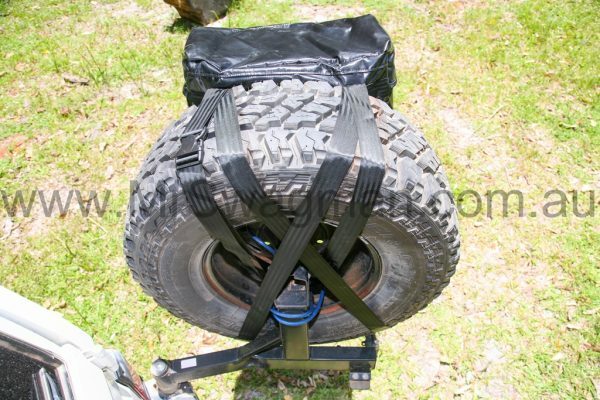 The main bag size is 60cm high X 50cm wide X 20cm deep making for an ideal size to fit most wheels and not obstruct other components and not hit on the ground while 4WDing.